Most AML compliance professionals are aware that they must record their KYC findings (and keep them)as per the provisions of the Bank Secrecy Act. Nevertheless, many still struggle to form a well-structured summary of their research and see this requirement as more of a chore than an integral part of their job. Many AML professionals also overlook the fact that a badly written summary can lead to a number of potential issues dealing with third parties, not to mention the regulator. It is essential that all members of your AML compliance team understand the benefits of writing a good KYC summary, the basics of how to structure and focus that summary, as well as the potential consequences of a summary that is not well written. 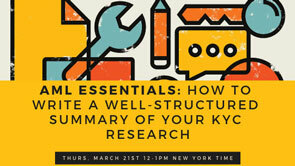 In this NoMoneyLaundering.com webinar, join our speaker for a crash course on how to write a well-structured, focused, and relevant summary of your KYC research, including the elements of a good narrative and hands-on practical examples to help you hone your writing skills. A few good and bad examples of KYC summary writing. Anna is a double qualified lawyer, being both a U.S. Attorney for the State of New York and admitted to the role of Solicitors for England & Wales. For the past two years, Anna has been the Legal Content Writer for nomoneylaundering.com, as well as its sister website sanctionsalert.com and the ACSS. She also conducts regular independent AML reviews of top money service businesses around the world. Before joining the ACSS, Anna spent 6 years working for the U.K.’s financial regulator in London – the Financial Conduct Authority (FCA), Enforcement Division – handling criminal breaches for insider dealing as well as civil AML regulatory cases. Earlier in her career, Anna gained experience working for the litigation departments of law firms in Paris, London, and New York. 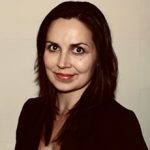 Saskia Rietbroek, Certified Anti-Money Laundering Specialist (CAMS) and an industry leader on anti-money laundering (AML) and related financial crime topics.